Kyrgyzstan: Will the new president break with his predecessor’s troubling human rights legacy? On 24th November 2017, Sooronbay Jeenbekov was inaugurated as Kyrgyzstan’s new president. He follows Almazbek Atambayev who led the country for six years but could not run for office again due to constitutional term limits. While the October presidential elections provided for a peaceful transition of power in the Central Asian country, the use of so-called administrative resources in support of Atambayev-endorsed candidate Jeenbekov significantly influenced the outcome. As covered in earlier Monitor updates, the end of Atambayev’s rule was marked by growing intolerance of criticism, attacks on media and civil society, and restrictions on fundamental rights. 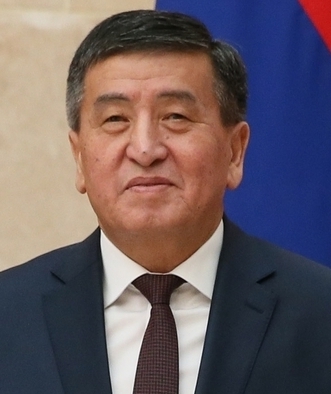 During his campaign, Jeenbekov pledged to continue Atambayev’s policies. However, in his campaign platform he also set out plans to ensure human rights for all and guarantees for free expression and free media, as well as improve cooperation with civil society. In a speech delivered on 10th December – Human Rights Day – the new president stressed the importance of consolidating human rights promotion efforts for the development of society. Civil society hopes that Jeenbekov will take concrete steps to break with Atambayev’s troubling legacy on free speech and human rights and act in support of these values. While it is too early to assess Jeenbekov’s human rights approach, some developments during his first period in office are not encouraging. In particular, the Supreme Court upheld financially-crippling defamation rulings against the independent Zanoza media outlet and its co-defendants because of articles deemed defamatory of the outgoing president. Separately, a foreign journalist living in the country for several years was deported without explanation. Shortly before Jeenbekov took office, a state agency threatened to sue the independent Kloop news outlet because of an investigation that suggested the president elect’s campaign had access to citizens’ government-stored, private data. Currently, the national security services are investigating the information reported by the outlet. These and other recent developments concerning freedom of expression, association and assembly in Kyrgyzstan from mid-October to mid-December 2017 are described below. International Partnership for Human Rights (IPHR) and the Legal Prosperity Foundation (LPF) have prepared this new update within the framework of their cooperation with the CIVICUS Monitor. On 30th November 2017, the Supreme Court upheld three earlier defamation convictions against the independent Zanoza news site (recently re-launched as Kaktus Media) and its co-defendants based on lawsuits that the General Prosecutor brought on behalf of outgoing President Atambayev. According to the court decisions, the media outlet, its founders, human rights defender Cholpon Djakupova and lawyers from the Ata Meken opposition party should pay moral damages amounting to a total of several hundred thousand euros to the ex-president because of articles about him which were deemed offensive. The Supreme Court rulings are final and cannot be appealed. As previously covered, media and human rights groups have criticised the defamation convictions in these cases and the excessive amounts the defendants have been required to pay. It is also highly problematic that national legislation tasks the General Prosecutor with taking legal action in response to alleged defamation of the president, which in this case extended to action on Atambayev’s behalf even after he left office. In a statement issued in response to the Supreme Court decision, over thirty NGOs expressed concerns over serious procedural violations during the proceedings against Zanoza and its co-defendants and said that the disproportionately large amounts imposed show that they were subject to persecution. The NGOs warned that court decisions such as these might force media outlets to close down because they cannot pay the moral damages, causing long-lasting damage to freedom of expression and contributing to self-censorship among media in the country. The signatories called on the authorities, including the new president, to initiate reforms to ensure that similar court decisions are not handed down against media and journalists in future. Human Rights Watch also called on President Jeenbekov to ensure that no journalist, media outlet, or human rights defender is unjustly prosecuted for defamation on his behalf. Court bailiffs have already taken measures to forcibly implement the decisions in the cases against Zanoza and its co-defendants. The Zanoza co-founders, Narynbek Idinov and Dina Maslova, as well as human rights defender Cholpon Djakupova, who was quoted in one of the articles found defamatory, have been banned from leaving the country and Idinov’s apartment and Djakupova’s property have been subject to seizure. One of the Ata Meken lawyers affected, Taailigul Toktakunovoy, stated that a court has blocked access to the bank account into which his salary is being paid. The defendants risk criminal charges for evading the court decisions if the moral damages are not paid. At the end of October 2017, the Kyrgyzstan’s State Registration Service announced that it was planning to file a lawsuit against the independent Kloop news agency because of its investigation into alleged misuse of citizens’ personal information and potentially inappropriate collaboration between the government and the campaign of president-elect Jeenbekov. With experts from the Swedish IT security group Qurium, Kloop journalists found that a voter management system operating on the obscure Samara.kg site was being hosted on the state agency’s server that stores citizens’ personal data, such as passport information, tax registration numbers and biometrics, a month before the elections. They also found that the Samara.kg was used by Jeenbekov’s campaign. The findings suggest that the president elect’s team had direct access to a large amount of detailed government-compiled information on voters. Kloop concluded that this not only threatened the security of citizens’ private data but also made it possible to manipulate the election. Kloop called on the security services, the Ministry of Interior and the General Prosecutor to investigate the activities of the State Registration Service. The State Registration Service denied the findings of the investigation and called them “speculations” and “illusions”. On its part, Kloop asserted that it had solid evidence to back up its assertions and was ready to defend them in court, noting that the state agency did not present any arguments refuting the findings. Kloop also said that it considered the statement by the State Registration Service about its intentions to sue the outlet an “attempt to put pressure on independent media for the purpose of distracting attention from the unlawful actions likely to have been committed by officers of the service or people with access to its server”. At his final press conference on 20th November, outgoing President Atambayev called the investigation into the Samara.kg site a “provocation” and said that the State Committee on National Security (SCNS) was looking into the issue. The SCNS later confirmed that it was investigating the information published by Kloop regarding this site and that it had summoned and questioned Kloop’s investigative journalist Rinat Tukhvatshin. According to Tukhvatshin, he was questioned for three hours, during which he explained in detail the findings presented in the Kloop article. When the security service officials asked whether the alleged Samara.kg site scheme had any impact on the results of the October presidential elections, he said that it influenced the effectiveness of Jeenbekov’s election campaign but not the vote count as such, as far as he and his colleagues could determine. On 9th December 2017, authorities in Kyrgyzstan denied entry to and deported Chris Rickleton, a British journalist working as Central Asia correspondent for Agence France-Presse (AFP). Border officials detained him after he arrived at Bishkek’s Manas airport on a flight from Colombo via Dubai and told him that he had to leave on the next flight back to Dubai. The grounds for the deportation order were not clear. In an appeal to President Jeenbekov published on Facebook, Rickleton said that he had been given no explanation and that he had not violated the 60-day visa free stay allowed for passport holders from the UK. He also said that since he started working for the AFP he has failed to obtain long-term accreditation with Kyrgyzstan’s Foreign Ministry, despite applying several times. He has been questioned twice by security services in this regard. Rickleton has been based in Kyrgyzstan for eight years and his wife and daughter are both citizens of the country. As covered in earlier updates, other journalists and human rights defenders have previously been denied entry to Kyrgyzstan on arbitrary grounds. Vitaliy Ponomarev, Central Asia Programme Director for the Moscow-based Human Rights Center Memorial, was denied entry to Kyrgyzstan in August 2017 without being informed of the reasons. In another example, Human Rights Watch researcher Mihra Rittmann has been barred from traveling to Kyrgyzstan since 2015. The September TV station filed an appeal with the Supreme Court, requesting it to overturn the lower level court decision banning its activities because it allegedly disseminated “extremist” material. These charges concerned an interview with a former regional police chief, who accused Sooronbai Jeenbekov and his brother of misappropriating government funds. As previously reported, the ruling against the TV channel was widely criticised, including by the Ombudsman. During his term in office, former President Almazbek Atambayev repeatedly attacked NGOs and their representatives in his speeches, accusing them of using foreign funds to destabilise the situation in the country. In one of his last public appearances as president at a student award ceremony on 18th October 2017, Atambayev again made such a statement. He claimed that the presidential elections held the same month had shown that foreign oligarchs, “agents of influence of the [US] State Department in Kyrgyzstan” and “all NGOs receiving money [from them]” had “united” in their efforts to influence the outcome of the elections. Other than this statement, LPF did not observe any other open and deliberate vilification of NGOs during this period. On 30th October 2017, Pervomaisky District Court in Bishkek ruled in favour of a lawsuit brought by the Bir Duino Human Rights Movement against national security services. The court found that a press release issued by the security services in January 2017, which accused the human rights NGO of obstructing a law enforcement operation to arrest an individual suspected of extremism in Osh region, was inaccurate and that the services should publish a retraction. Bir Duino has stressed that it had nothing to do with this arrest and that no one from the organisation was present when it took place. The NGO also noted that the security services published the press release the same day the retrial of human rights defender Azimjan Askarov ended, a case in which Bir Duino’s lawyers provided assistance to the defender. The security services’s press release was widely disseminated at the time, discrediting the human rights NGO. The court hearing on the lawsuit was repeatedly postponed several months before the October decision was handed down. After the verdict was announced, Bir Duino said that it was satisfied with it and expressed hope that national courts also hereafter “will work within the framework of the law”. During the reporting period, dozens of peaceful assemblies were held in the country on a range of issues of concern to different parts of the population. Among other issues, citizens protested against the construction of a medical centre in the capital region, against development project at glaciers and against early marriages. Several protests held by residents of the Talas region in north-western Kyrgyzstan attracted wide attention. Participants demanded that outgoing President Atambayev apologise for criticising those who took part in a rally held in the region on 16th October, when supporters of Omurbek Babanov protested the outcome of the presidential elections. Babanov ended second in the presidential race, garnering 34 percent of the vote. In a public appearance on 18th October, Atambayev spoke at length about the rally and said that participants “should be ashamed” because they prevented a representative of the government in the Talas region from reciting the Kyrgyz national epic entitled Manas with their shouts and whistles. The head of the presidential administration informed Radio Free Europe/Radio Liberty that the president was right in what he was saying and that he has no intentions of apologising. A new court ruling imposing a blanket ban on protests in central Bishkek has raised serious concerns. On 8th November 2017, Pervomaisky District Court banned all assemblies outside the White House (which accommodates the presidential office and the parliament), the House of Government, the Central Election Committee, and court buildings in this district of the capital through 1st December. Thus, the ban covered the period before and after the inauguration of the new president on 24th November. In its ruling, the court argued that assemblies disrupt “the stability of vital functions” in the capital and cause “concern and discontent” on the part of citizens, especially elderly ones. This was already the third court-imposed blanket ban on assemblies in the capital since the summer 2017. As IPHR and LPF have previously stressed, these types of bans run contrary to both national law and international standards protecting freedom of peaceful assembly. On 5th December 2017, the Kylym Shamy human rights NGO organised a roundtable to discuss current challenges to peaceful assembly in the country. Human rights activists who participated in the event expressed concerns over the worrying court practice of imposing blanket bans on assemblies in certain venues for prolonged periods. Activists also voiced concerns that those holding peaceful protests have increasingly been subjected to intimidation, pressure and surveillance by law enforcement authorities. Based on the discussion at the roundtable, the participants agreed on a number of recommendations to the authorities. These included requesting the Ombudsman’s office to prepare a study on current issues of concern regarding peaceful assembly and to document these in the office’s annual report; establishing a working group to address the challenges as identified; and including provisions into the Law on Assemblies for a mechanism that could respond to unlawful court decisions on assemblies. They also recommended inviting the UN Special Rapporteur on peaceful assembly and association to Kyrgyzstan.